National Entrepreneurship Forum (NEF) was initiated by AIESEC, the largest student driven organization in the world, and was fully supported by Universitas Indonesia, whose economic faculty is considered the best in this country. I was once again very honored to be invited to such event. I was about to start writing about this fun event (held in one fine Saturday morning, when I supposed to be sleeping and wake up late. Oh well..) until a message appeared on my Facebook, sent from Besty P. Yustika, who attended NEF and shared me the link to her blog. After reading it, I decided to abort my writing mission and show hers instead, as she wrote it a hundred times better than me. Please read it, you’ll like it. I went to the workshop with Trisna and her sister, Fithri. We got to the Faculty of Economics where the venue was located at 09.40 and although I was told the workshop would start at 08.30, thankfully, it hadn’t started when we entered the auditorium. Trisna walked towards the empty seats at the front row. Fithri followed without hesitation. They chose the very front seats at the centre part. “Are we sitting here?” I asked uncertainly, still standing, pointing at the chairs at the front row. “Yes,” said Fithri, who was taking a seat, “so that we can get the most value out of our money,” she added. Hmm, good point. Why not make each cent of Rp. 60,000,- ticket price I paid worthwhile, especially when I already missed the seminar on the first day. By sitting at the front, chances are, you will tend to absorb more information or ‘forced’ to pay more attention. The auditorium was already 60% filled and judging from the appearance, I bet most of the participants were university students…which..kind of made me feel ‘senior’ – if ‘old’ is not the proper word to describe it. Among the speakers that day were photographer Jerry Aurum, Bambang Ifnuruddin Hidayat of Property Plus and Hendy Setiono, owner of Kebab Turki Baba Rafi. In general, their presentations talked about the nature of each business; photography and graphic design, property as being the developer and food retail. What was more interesting, they shared their good and bad experience which naturally revealed their profiles, backgrounds and stories in the early days of their business. Jerry Aurum who opened up the presentation emphasized on getting start with your business, making trial and error and learning from the mistakes. The essence of his saying is that, we gain experience by doing things wrong. We commonly do things wrong when we start making something. So, start making it happen and begin taking lessons from your failure. For those who are in constant doubts, his message was clear: You don’t need to wait until you’re ready. It’s ok to make mistakes. The most important thing is to start first. For those who think about running a business while working as employee, his statement was even more obvious: Impossible. As an alternative, he advised to set a deadline. For instance, quit your job, set a one-year-period to try a business. If it doesn’t seem to go anywhere at all then go back looking for employment. For those who face negative comments from their surrounding, he referred it as a challenge that will grow as you proceed. He gave an example. One time he got complaints from his client, a big national company. All of a sudden, the discouraging response from his mother on his choice of career years back, seemed to be nothing. He also pointed out creativity as being different. It doesn’t take an artist to be creative. Even a person with the slightest sense of art can differentiate him/herself from others (with his/her own unusual way). Another story Jerry shared with us is when he employed 20 staffs, but felt everything had become too stressful. As a result, he decided to focus more on doing photography, making it the cash cow for his business and on the contrary, downsize the graphic design service. At the end, there was a total cut down from 20 staffs to only 5. But, he didn’t just sack these people. Instead, he supported them to be independent as part of his social responsibility. This support must have included knowledge-sharing, which I’m sure Bambang of Property Plus couldn’t be more agree. Bambang Ifnuruddin Hidayat obtained his Bachelor degree in textile studies and pursued a career working for a textile company. After leaving his job 12 years ago with latest salary of Rp. 25,000,000,-/ month, he embarked on a journey as property developer. 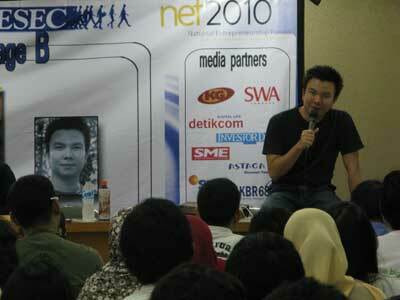 His solid experience in growing the business cannot be separated by what he called ‘local wisdom’ or ‘kearifan lokal’. I think of all the above-mentioned points, the latter is the most crucial one, particularly when it comes to convincing a landowner to release his/her valuable asset – land. I can imagine the level of trust you would need to build upon. Nevertheless, I’m sure it’s worth the effort. He also reminded me of the art of delegation by outsourcing. In his case, he has always outsourced bureaucratic legal and administration stuffs. Save the time, avoid the fuss, focus on your main task. The last speaker, Hendy Setiono, is 26 years old, yet he has won several awards in entrepreneurship nation-wide and in Asia-Pacific. His initial business was Kebab Turki Baba Rafi which he started 7 years ago when he was 19. He quoted a research done by Action Coach which shows that 80% of business fails between the first year until 5th year, making only 20% succeeds. But, from this 20%, only 20% of it continues to survive until year 10. This fact shows that business indeed takes hard work, planning and commitment, which underlines Hendy’s statement that there is no such thing as side-business (bisnis sampingan/ sambilan). I suppose what he said is parallel to what our first speaker said that it is impossible being an employee and running a business at the same time. Business is about focus. Business is about being consistent. One of Hendy’s food businesses, Ayam Bakar Mas Mono was originally traditional food stall he found in Tebet area. He transformed the traditional management into professional management which eventually elevates the brand. This kind of workshop, I can tell, is not the first I’ve ever had. When I was in Glasgow I went to a young entrepreneurship workshop held at SECC with Ika and Lulu. The speakers were successful Scottish entrepreneurs, like Charan Gil (owner of Indian chain restaurant, Ashoka), Michelle Mone (who ran lingerie business), one guy who made a fortune from media business and a young man who operated catering company and whom Ika once worked for as freelance staff. It was very inspiring and I remember having this ‘bubbly’ feeling when the workshop finished. Now, after yesterday’s workshop, I also have ‘light’ feeling, but somehow it’s different from the one I had. The thing is, I joined the workshop in Glasgow 3 years ago before starting the soap business. This time, I came to the forum after having the experience of running a soap business. Consequently, I can relate bits and pieces of what they said with my own story. Some of the shared experience is relevant to my own experience, although they are success stories, while mine is not even a profitable one :P.
When Jerry Aurum suggested taking a full year to do business, I thought to myself, I’ve been there, done that. I did the soap business for a year after leaving my job at a nation-wide retail group. When the soap business turned up to be a loss, I began applying for jobs again. Now, after working for nearly 9 months, my conscience sort of pushes me again to give another shot and launch another business venture. I would do more sharing and delegating, too as I should have done in the past. This self-reflection gives me some sort of confidence. I think the lessons learned have never been so real especially on how to measure, take logical action, do things better and be committed. Indirectly, it has paved my way to carry out more realistic business steps, not just relying on mere dream and hope. Referring to the Action Coach survey, we’ll see 5 years from now whether or not my next business will still exists. If yes, then we can sum up that every cent I spent for this forum worth a value. Until then, first thing to do is to put into practice the lessons learned. Well, my friends, what are you waiting for? Be an entrepreneur today.